WARNING: Tell your doctor you are using enoxaparin before having certain spinal procedures (spinal puncture or spinal/epidural anesthesia). Use of this medication before these procedures has rarely caused major bleeding or blood clots in or around the spine. This effect may cause paralysis that may be permanent. Discuss the risks and benefits of treatment with your doctor. Tell your doctor immediately if you have any of these serious side effects: tingling, weakness, numbness, trouble urinating, or pain. This risk is increased if you use a type of device placed in the spine to deliver pain medications (epidural catheter). In addition, the risk is higher if you use other "blood thinning" or anti-platelet medications such as aspirin, clopidogrel, warfarin, or nonsteroidal anti-inflammatory drugs (NSAIDs) such as ibuprofen or naproxen. Do not stop taking any prescribed medication without first consulting your doctor. USES: Enoxaparin is used to prevent and treat harmful blood clots. Preventing harmful blood clots helps to reduce the risk of a stroke or heart attack. This medication helps keep your blood flowing smoothly by lowering the activity of clotting proteins in the blood. Enoxaparin is sometimes commonly referred to as a "blood thinner," but its more correct term is "anticoagulant." It is a type of heparin. Conditions which increase your risk of developing blood clots include certain types of surgeries (e.g., knee or hip replacement), long periods of being immobile, certain types of heart attack, and a specific type of chest pain called unstable angina. For some medical conditions, enoxaparin may be used in combination with other "blood thinners." HOW TO USE: If you are giving the shots yourself, you will be trained by a health care professional on how to properly prepare, inject, and use this product. If any of the information is unclear, consult your health care professional. Inject enoxaparin under the skin (subcutaneously) usually once or twice a day in the abdomen (at least 2 inches from your belly button), or use as directed by your doctor. Do not inject into a muscle or a vein. Before using this product, check it visually for particles or discoloration. If either is present, do not use this product. To minimize irritation, change the injection site with each dose. To minimize bruising, do not rub the injection site after a shot. Learn how to store and discard needles and medical supplies safely. Consult your pharmacist for more details. Use this medication regularly in order to get the most benefit from it. To help you remember, use it at the same time(s) each day. Dosage and length of treatment are based on your medical condition (e.g., severe kidney disease) and response to therapy. Dosage may also be based on your weight for some conditions. SIDE EFFECTS: See also Warning. Mild irritation, pain, bruising, redness, or swelling at the injection site may occur. Fatigue or fever may also occur. If any of these effects persist or worsen, notify your doctor or pharmacist promptly. Remember that your doctor has prescribed this medication because he or she has judged that the benefit to you is greater than the risk of side effects. Many people using this medication do not have serious side effects. This medication can cause bleeding if its effect on your blood clotting proteins is too much. Tell your doctor immediately if any of these unlikely but serious signs of bleeding occur: unusual pain/swelling/discomfort, unusual or prolonged bleeding, unusual or easy bruising. Tell your doctor immediately if any of these rare but very serious signs of bleeding occur: dark urine, black stools, severe headache, confusion, vision changes, unusual dizziness, fainting, seizures, weakness, numbness. A very serious allergic reaction to this drug is unlikely, but seek immediate medical attention if it occurs. Symptoms of a serious allergic reaction may include: rash, itching/swelling (especially of the face/tongue/throat), severe dizziness, trouble breathing. This is not a complete list of possible side effects. If you notice other effects not listed above, contact your doctor or pharmacist. In the US - Call your doctor for medical advice about side effects. You may report side effects to FDA at 1-800-FDA-1088. In Canada - Call your doctor for medical advice about side effects. You may report side effects to Health Canada at 1-866-234-2345. PRECAUTIONS: Before using enoxaparin, tell your doctor or pharmacist if you are allergic to it; or to heparin or pork products; or if you have any other allergies. This product may contain inactive ingredients (such as the preservative benzyl alcohol in the medication vial), which can cause allergic reactions or other problems. Talk to your pharmacist for more details. This medication should not be used if you have certain medical conditions. Before using this medicine, consult your doctor or pharmacist if you have: serious active bleeding. 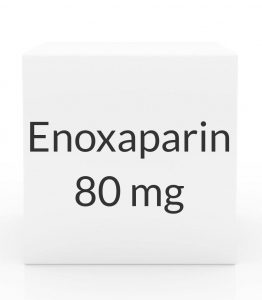 Before using enoxaparin, tell your doctor or pharmacist your medical history, especially of: artificial heart valves, severe kidney disease, liver disease, bleeding or blood disorders (e.g., low platelet counts), low platelet counts after previous heparin treatment, stroke, uncontrolled severe high blood pressure, certain eye problems (e.g., diabetic retinopathy), certain stomach/intestinal problems (e.g., active or recent ulcers), recent spinal procedure or puncture, spine problems (such as spinal deformity), recent eye/brain/spinal cord surgery. Limit alcohol while taking this drug because it may increase the risk of stomach bleeding. Before having surgery, tell your doctor or dentist that you are using enoxaparin. This medication can infrequently cause heavy bleeding. Be extra careful to avoid injuries (e.g., contact sports). Use an electric razor when shaving and a soft toothbrush when brushing your teeth. Caution is advised when using this drug in the elderly because they may be more sensitive to its side effects, especially bleeding. Enoxaparin should be used only when clearly needed during pregnancy. Discuss the risks and benefits with your doctor. Pregnant women with artificial heart valves need close monitoring (see Notes). Since enoxaparin vials contain benzyl alcohol that can affect the unborn baby, the preservative-free drug in the manufacturer's syringes is preferred. It is not known whether this drug passes into breast milk. Consult your doctor before breast-feeding. DRUG INTERACTIONS: Your healthcare professionals (e.g., doctor or pharmacist) may already be aware of any possible drug interactions and may be monitoring you for it. Do not start, stop, or change the dosage of any medicine before checking with them first. This drug should not be used with the following medication because very serious interactions may occur: mifepristone. If you are currently using mifepristone, tell your doctor or pharmacist before starting enoxaparin. Before using enoxaparin, tell your doctor or pharmacist of all prescription and nonprescription/herbal products you may use. This medication is sometimes used together with other drugs that have "blood thinning" or anti-platelet effects such as aspirin, clopidogrel, or warfarin. When these combinations are prescribed by your doctor, you will require closer monitoring to minimize your risk of bleeding. Keep all medical and laboratory appointments. Check all prescription and nonprescription medicine labels carefully since many contain pain relievers/fever reducers (NSAIDs such as ibuprofen, naproxen, or aspirin) which can increase the risk of bleeding/anti-platelet effect when used with enoxaparin. Low-dose aspirin, as prescribed by your doctor for specific medical reasons such as heart attack or stroke prevention or to prevent clotting of artificial heart valves (usually these dosages are 81-325 milligrams per day), should be continued. Consult your doctor or pharmacist for more details. This document does not contain all possible interactions. Therefore, before using this product, tell your doctor or pharmacist of all the products you use. Keep a list of all your medications with you, and share the list with your doctor and pharmacist. OVERDOSE: If overdose is suspected, contact your local poison control center or emergency room immediately. US residents can call the US national poison hotline at 1-800-222-1222. Canadian residents should call their local poison control center directly. Symptoms of overdose may include excessive bleeding and bruising. NOTES: Do not share this medication with others. Laboratory and/or medical tests (e.g., blood counts including platelets, checking your stool for blood) should be performed periodically to monitor your progress or check for side effects. Additional lab tests (anti-factor Xa blood levels) should be performed in certain cases, especially if you have severe kidney disease, are pregnant and have artificial heart valves, or if lack of effectiveness of enoxaparin is suspected. Consult your doctor for more details. MISSED DOSE: Try not to miss any doses. If you miss a dose, use it as soon as you remember. If it is near the time of the next dose, skip the missed dose and resume your usual dosing schedule. Do not double the dose to catch up. STORAGE: Store the US product at room temperature (77 degrees F or 25 degrees C). Brief storage between 59-86 degrees F (15-30 degrees C) is permitted. Store the Canadian product at room temperature 59-86 degrees F (15 to 30 degrees C) away from heat. Do not store the multiple dose vials for more than 7 days after the first use. Store the medication away from light and moisture. Do not store in the bathroom. Keep all medicines away from children and pets. Do not flush medications down the toilet or pour them into a drain unless instructed to do so. Properly discard this product when it is expired or no longer needed. Consult your pharmacist or local waste disposal company for more details about how to safely discard your product.